Titanium thin films have strong temperature dependence of the electron-photon coupling, so superconducting titanium (Ti) thin film is one of good candidates for superconducting thermometers in superconducting transition edge sensors (TESs) which are sensitive detectors in a wide spectrum region from γ-ray, x-ray, optical and far-infrared to millimeter wavelengths. Researchers led by Prof. Sheng-Cai Shi, Purple Mountain Observatory, Chinese Academy of Sciences, have investigate the properties of the electron-beam evaporated Ti thin films for antenna coupled transition edge sensors. 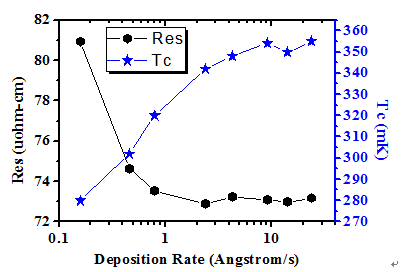 They found an appropriate deposition rate range to get superconducting Ti thin films with moderate stress, stable resistivity and maximum transition temperature, and used a power law to fit the thickness dependences of the Ti film transition temperature and resistivity very well, which will help to improve the process efficiently and fabricate high quality superconducting TESs. Fig. 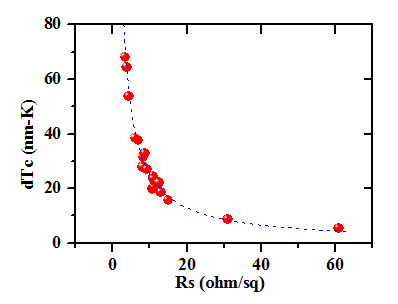 2 The thickness (d) dependences of the Ti film transition temperature (Tc) and sheet resistance (Rs).